The wwPDB and the EMDataBank/Unified Data Resource for 3DEM Project have collaborated to update the experimental methods descriptions of all electron microscopy and electron crystallography-derived structures in the PDB archive. With this work now completed, all 3DEM-derived entries have better-organized content and conform to the revised data model developed by the EMDataBank team for use within the wwPDB OneDep System. The OneDep System has supported deposition, annotation, and validation of 3DEM structures and fully integrates deposition of 3DEM maps and model coordinates since January 2016. Examples of 3DEM model files (both remediated and from the OneDep system) are provided in a new wwPDB ftp directory (ftp://ftp.wwpdb.org/pub/pdb/test_data/EM/). A data-item level description of the changes made during remediation is provided here. 3DEM terms in the updated PDBx/mmCIF dictionary can be reviewed here. Files in the current PDB ftp archive will be replaced with new files corresponding to the updated PDBx/mmCIF dictionary in 2017. Users are encouraged to review and test the example data files. The wwPDB and the EMDataBank/Unified Data Resource for 3DEM Project (https://www.ncbi.nlm.nih.gov/pubmed/26578576) are collaborating to update the experimental methods descriptions of all electron microscopy and electron crystallography-derived structures in the PDB archive. When completed, all 3DEM-derived entries will have better organized content and will conform to the revised data model developed by the EMDataBank team for use within the wwPDB OneDep System. Since January 2016 the OneDep system (http://wwpdb.org/deposition/system-information) has supported deposition, annotation, and validation of 3DEM structures and fully integrates deposition of 3DEM maps and model coordinates. Examples of remediated model files will be provided in a new wwPDB ftp directory (ftp://ftp.wwpdb.org/pub/pdb/test_data/EM/) and the corresponding PDBx/mmCIF dictionary will be released in December 2016. Files in the current PDB ftp archive will be replaced with new files corresponding to the updated PDBx/mmCIF dictionary in 2017. Users are encouraged to review and test the example data files. In January 2014, the wwPDB launched a unified deposition, annotation, and validation system (RCSB PDB | PDBe | PDBj) for structures determined using X-ray crystallography. More than 14000 structures have been deposited, annotated, and validated using this system, with more than 9000 structures already released into the PDB archive. The new system uses the PDBx/mmCIF data format, which produces more uniform data, supports replacement of data files pre- and post-deposition, enhances communication with depositors, enables improved annotation, and provides validation reports based on recommendations from wwPDB expert task forces. Improvements to this system are regularly incorporated in response to user feedback. Detailed information and video tutorials are available. An extended version of the unified wwPDB deposition, annotation, and validation system supporting structures determined by X-ray crystallography, NMR, and 3D EM was launched January 8th 2016. The extended system is integrated with the repositories for NMR and 3D EM experimental data and can assign both BMRB and EMDB accession codes. Starting September 30th 2016, the legacy deposition systems, AutoDep, ADIT-NMR (BMRB|PDBj) and EMDep, no longer accept new PDB and EMDB submissions. An updated ADIT-NMR system (available from BMRB and PDBj-BMRB) will continue to accept NMR data associated with a structure currently not accepted by the unified wwPDB deposition system (for example, relaxation data, and primary time-domain spectra) as well as experimental NMR data not associated with the deposition of 3D coordinates. Questions and comments should be sent to deposit-help@mail.wwpdb.org. The new wwPDB Validation Server at https://validate.wwpdb.org now generates preliminary validation reports for structures solved by NMR and 3D Electron Microscopy, in addition to X-ray crystallography. wwPDB strongly encourages the use of the Validation Server at any time during the structure determination process, but particularly when preparing structures for deposition to the wwPDB. Validation Server reports provide identical information to the ones generated at deposition. Structural models may be assessed independently or together with experimental data (crystallographic structure factors or NMR chemical shifts) for validation of model/data correspondence. Effective September 6th, 2016, deposition to the PDB of atomic models determined by 3D Electron cryo-Microscopy (3DEM) will require prior or simultaneous deposition of the associated 3DEM volume maps to EMDB. Maps and models can be deposited at a member site of the Worldwide Protein Data Bank (wwpdb.org) using the joint PDB, EMDB and BMRB deposition tool made available by RCSB PDB (http://deposit.wwpdb.org), PDBe (https://deposit-pdbe.wwpdb.org), and PDBj (http://deposit-pdbj.wwpdb.org). Data can be released following the authors' release instructions, once they have been processed and approved. wwPDB and EMDB policies both allow for a maximum hold period of one year for model and associated map depositions. Note that (starting September 6th, 2016) for joint PDB/EMDB depositions, the hold period will be the same for the map(s) and the model(s). This policy change aligns the deposition requirements for 3DEM models with those for structures determined by other techniques, for which deposition of experimental data has been mandatory since 2008. The policy change was developed on the basis of input from the PDB and EMDB user communities and has been unanimously endorsed by the wwPDB Advisory Committee. Questions regarding depositions should be sent to: deposit-help@mail.wwpdb.org. To enable better annotation and tracking, the wwPDB partners encourage depositors to provide ORCID identifiers and information on relevant grants funding their research when depositing PDB data. ORCID identifiers are unique to each researcher; usage will help avoid ambiguity in attributing the correct authorship of PDB, BMRB, and EMDB entries. In order to register an ORCID, please visit http://orcid.org. Provision of funding agency and grant information will enable better impact tracking and statistics. The mission of the Worldwide Protein Data Bank (wwPDB) is to maintain a single Protein Data Bank archive of macromolecular structural data that is freely and publicly available to the global community. The wwPDB website links to member websites, deposition resources, and information about data dictionaries and file formats. Starting June 30, this website can be accessed via wwPDB.org or PDB.org. RCSB PDB resources will continue to be hosted at RCSB.org. No changes need to be made to bookmarked RCSB PDB resources. Starting May 31st 2016, the legacy deposition systems, AutoDep, ADIT-NMR (BMRB|PDBj) and EMDep, will no longer accept new PDB and EMDB submissions. The AutoDep system will be accessible until August 25th 2016 and ADIT-NMR and EMDep systems will be accessible until September 30th 2016 for depositors to complete their in-progress deposition sessions. Effective May 25, 2016, new deposition sessions will be directed to the wwPDB partner site designated for processing: Europe and Africaâ†’PDBe/UK; Asia and the Middle Eastâ†’PDBj/Japan; and Americas, Australia, and Oceaniaâ†’RCSB PDB/US. This new arrangement will help to ensure faster response times for communications and balanced distribution of the data curation load among the wwPDB partner sites. At the start of a new session at any of the three wwPDB partner sites (http://deposit.wwpdb.org, http://deposit-pdbe.wwpdb.org, http://deposit-pdbj.wwpdb.org), depositors will select from a pull down list the country corresponding to the location of PI's institution. Doing so will automatically direct the deposition session to the appropriate wwPDB partner site. Deposition statistics, including the number of PDB depositions by depositor location (the location of PI's institution), are available at http://wwpdb.org/stats/deposition. PDB depositors can help the structure modeling community test prediction methods by making protein sequences available while the structure is on hold. To designate your structure as a CASP target, use the Release Status page during deposition. Â Ideal candidates would have a sequence identity to available structures below 50% or are otherwise interesting for prediction. Once an entry is flagged as a CASP target, the sequence will be released immediately for target prediction and the entry will be automatically held for 8 weeks. Visit CASP for more information at http://www.predictioncenter.org/casp12/index.cgi. The wwPDB Partners and the EMDataBank are pleased to announce that validation reports for all Nuclear Magnetic Resonance (NMR) and 3D Cryo Electron Microscopy (3DEM) structures already represented in the global PDB archive have been publicly released. These reports assess the quality of each structure and highlight specific concerns, by examining the coordinates of the atomic model derived from either NMR and 3DEM, and by comparing the coordinates of the atomic model derived from NMR with primary experimental data therefrom. Readily interpretable summary information compares the quality of the atomic model with structural models from across the entire archive, thereby helping users of PDB data critically evaluate the quality of each archival entry. These new validation reports implement recommendations provided by NMR and 3DEM community experts on validation, while reusing elements of the validation schema developed for structures determined by X-ray crystallography. The X-ray, NMR, and 3D EM method specific validation pipelines were developed in the context of a larger global wwPDB initiative, the new common wwPDB Deposition and Annotation System, which was created to unify deposition, annotation, and validation practices used across all wwPDB partner sites. Since January 2016, the new NMR and 3DEM structure-validation reports have been provided to depositors as part of the wwPDB Deposition and Annotation System to help identify potential problems that should be addressed prior to PDB deposition and publication. Further information, including the new Validation Report User Guide, is available. We welcome your feedback. Please send any comments or questions to validation@mail.wwpdb.org. 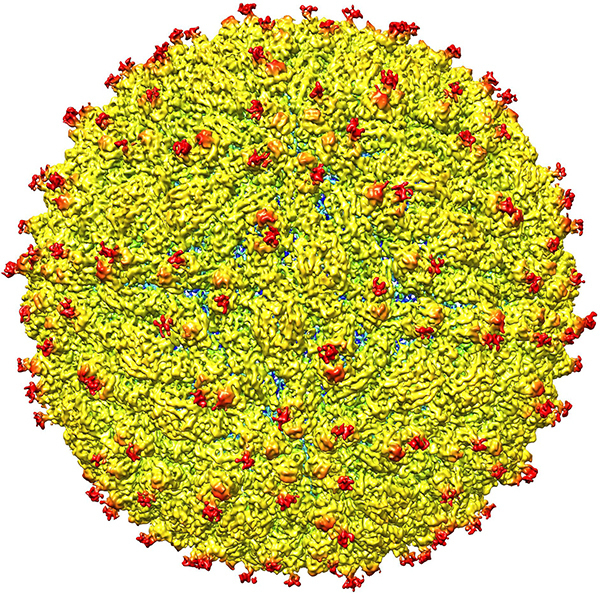 The 3D structure of the Zika virus, determined by cryo-electron microscopy, has been released. Public availability of the Zika virus atomic coordinates to medical researchers worldwide will accelerate new antiviral drug and vaccine development. The structure is described in The 3.8Ã… Resolution Cryo-EM Structure of Zika Virus by Devika Sirohi, Zhenguo Chen, Lei Sun, Thomas Klose, Theodore C. Pierson, Michael G. Rossmann, Richard J. Kuhn, published online today by Science. The atomic coordinates (PDB ID 5ire) are freely and publicly available from the PDB archive, and readily accessible from wwPDB partner sites: RCSB PDB (http://rcsb.org), PDBe (http://pdbe.org), and PDBj (http://pdbj.org). The corresponding electron microscopy map (EMD-8116) is freely and publicly available from the EMDB archive, which is distributed through the PDBe, RCSB PDB and PDBj web and ftp sites. Effective May 8th 2016, depositors submitting PDB data will have the option to suppress the entry's author list and title prior to public release of the structure. This functionality will be available on an opt in basis. Depositors who opt in will have their entry author list and title hidden from searches of unreleased PDB structures. This option is being added to the wwPDB Deposition, Annotation, and Validation System at the request of the depositor community. It is anticipated that this feature will benefit the manuscript review process. Journals will be able to request wwPDB validation reports to enable more informed referee review, while respecting depositor confidentiality. Depositors are strongly encouraged to complete their data submissions before manuscript submission to the journals. Depositors are similarly encouraged to provide the official wwPDB validation report to the journals at the time of manuscript submission. Starting May 31st 2016, the legacy deposition systems, AutoDep, ADIT-NMR (BMRB|PDBj) and EMDep, will no longer accept new PDB and EMDB submissions. Depositors with in-progress sessions on the legacy systems will be able to access and complete their deposition sessions until September 30th 2016. The wwPDB partners are pleased to announce that updated validation reports for all X-ray crystal structures deposited in the PDB archive were made available on March 9, 2016. A copy of the previous version is archived at RCSB PDB and PDBj. These updated wwPDB validation reports provide an assessment of structure quality using widely accepted standards and criteria, recommended by community experts serving in the Validation Task Force. The wwPDB partners strongly encourage journal editors and referees to request them from authors as part of the manuscript submission and review process. The reports are date-stamped and display the wwPDB logo, and contain the same information, regardless of which wwPDB site processed the entry. Provision of wwPDB validation reports is already required by eLife, The Journal of Biological Chemistry, the International Union of Crystallography (IUCr) journals, FEBS journals, and the Journal of Immunology as part of their manuscript-submission process. Validation reports are also provided to depositors in the new wwPDB Deposition and Annotation System. Depositors are required to review and accept the reports as part of the data submission process. Going forward validation reports will be further developed and improved as we receive recommendations from the expert Validation Task Forces (VTF) for X-ray, NMR, and EM, as we develop the wwPDB Deposition & Annotation (D&A) system, and as we collect feedback from depositors and users. The earlier version of the X-ray structure-validation reports have been provided to depositors as part of the structure-annotation process since August 2013. They were first made public in March 2014. Similar reports for structures determined by Nuclear Magnetic Resonance (NMR) and 3D Cryo Electron Microscopy (3DEM) will become available in May 2016. Further information and sample X-ray validation reports are available. Your feedback, comments, and questions are welcome at validation@mail.wwpdb.org. The wwPDB Partners and the EMDataBank are pleased to announce that validation reports for all Nuclear Magnetic Resonance (NMR) and 3D Cryo Electron Microscopy (3DEM) structures already represented in the global PDB archive will become publicly available in May. The new validation reports assess the quality of each structure and highlight specific concerns, by examining the coordinates of the atomic model derived from either NMR and 3DEM, and by comparing the coordinates of the atomic model derived from NMR with primary experimental data therefrom. Readily interpretable summary information compares the quality of the atomic model with structural models from across the entire archive, thereby helping users of PDB data critically evaluate the quality of each archival entry. The new validation reports implement recommendations provided by NMR and 3DEM community experts on validation, while reusing elements of the validation schema developed for structures determined by X-ray crystallography. The X-ray, NMR, and 3D EM method specific validation pipelines were developed in the context of a larger global wwPDB initiative, the new common wwPDB Deposition and Annotation System, which was created to unify deposition, annotation, and validation practices used across all wwPDB partner sites. The wwPDB partners are pleased to announce that validation reports for all X-ray crystal structures deposited in the PDB archive will be updated in March. These wwPDB validation reports provide an assessment of structure quality using widely accepted standards and criteria, recommended by community experts serving in the Validation Task Force. The wwPDB partners strongly encourage journal editors and referees to request them from authors as part of the manuscript submission and review process. The reports are date-stamped and display the wwPDB logo, and contain the same information, regardless of which wwPDB site processed the entry. Provision of wwPDB validation reports is already required by eLife, The Journal of Biological Chemistry, the International Union of Crystallography (IUCr) journals, FEBS journals, and the Journal of Immunology as part of their manuscript-submission process. Similar reports for structures determined by Nuclear Magnetic Resonance (NMR) and 3D Cryo Electron Microscopy (3DEM) are under development. Your feedback, comments or questions are welcome at validation@mail.wwpdb.org. From 12:00 noon to 2 pm UTC on Saturday, January 30, the wwPDB Deposition & Annotation System will be down for maintenance. New and in-progress data depositions will be accessible after this brief window. The wwPDB partners are pleased to announce the launch of a new Deposition & Annotation system that supports structures determined using 3DEM, NMR, and X-ray, neutron and electron crystallography. New entries from all methods can be submitted online (RCSB PDB | PDBe | PDBj). This new system interoperates with EMDB and BMRB to enable joint depositions of both atomic coordinates (PDB) and EM electron-density maps (EMDB) or NMR experimental data (BMRB). PDB, EMDB and BMRB accession codes will be issued as appropriate immediately after a structure has been deposited. A brief tutorial is available at http://www.wwpdb.org/deposition/tutorial. In January 2014, the wwPDB launched the Deposition & Annotation system for structures determined using X-ray crystallography in the first phase of our roll-out of a single global system for deposition and annotation of structural data. Using this system, more than 12,000 X-ray structures have been deposited and annotated, and more than 6,800 entries released in the PDB archive. New or enhanced features of the global combined X-ray/3DEM/NMR wwPDB Deposition & Annotation system include generation and review of validation reports that follow wwPDB Task Force recommendations,1,2,3 improved capture and review of ligand information, replacement of atomic coordinate and/or experimental data files both pre- and post-submission, and improved communication between depositors and wwPDB curators. In addition to the new system, depositors will continue to have the option of using one of the legacy deposition tools (EMDep, ADIT-NMR, AutoDep) to start a new deposition for at least the first half of 2016. Once the new system is deemed stable, the legacy deposition tools will be phased out with sufficient time allowed for completion of in-progress sessions. This process mirrors the one used in early 2015 for successful shutdown of the legacy ADIT system supporting deposition of X-ray structures. A snapshot of the PDB archive (ftp://ftp.wwpdb.org) as of January 1, 2016 has been added to ftp://snapshots.wwpdb.org/. Snapshots have been archived annually since January 2005 to provide readily identifiable data sets for research on the PDB archive. The directory 20160101 includes the 114,679 experimentally-determined coordinate files and related experimental data available at that time. Coordinate data are available in PDB, mmCIF, and XML formats. The date and time stamp of each file indicates the last time the file was modified. The snapshot is 555 GB.